Yeong Yang's latest 5U server chassis, the chassis could be configure as a pedestal server, and also could be defined as 5U 19" rack server chassis.YY-W2xx accommodates 8-5.25"drive bay, keep flexibility and scalability to system's configuration. YY-W2 series is an excellent thermal solution with 12cm cooling fans, easy installation and maintenance are assured via the chassis' compliance with ATX and EEB3.0. The power supply could be Single ATX or Mini Redundant, output ranges from 400W to 550W optional.The chassis could be optional configure to come with backplane for IDE hot swappable HDD trays as well as for SCA2 type HDD could work with IDE RAID card or SCSI RAID card. 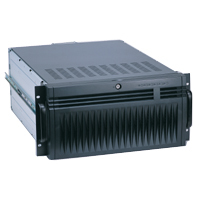 The YY-W2 measures 220mm x 427mm x 600mm(depth) features correct thermal cooling system and high density storage ability specifically designed for the front end servers and database applications. .19" x 5U x 17"